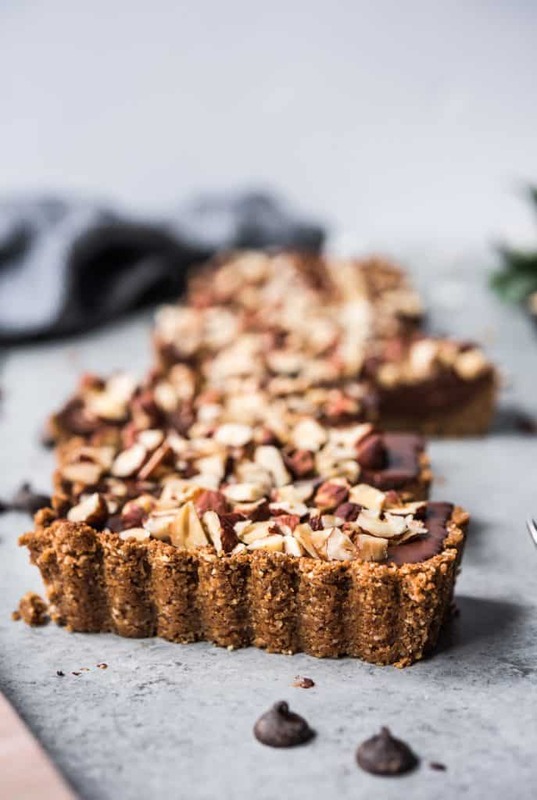 This vegan dark chocolate hazelnut tart has a buttery graham cracker-hazelnut crust, a dense chocolate ganache filling, and plenty of crushed hazelnuts for crunch. It’s like Nutella, but better and without the dairy + sugar overload! Made in a fluted tart pan, it also looks as good as it tastes. It’s sure to be a show-stopper at your next get-together (or weeknight meal!). Totally meant to share this recipe a few weeks ago (before the holidays), but life got in the way. Hey, late is better than never, right?! 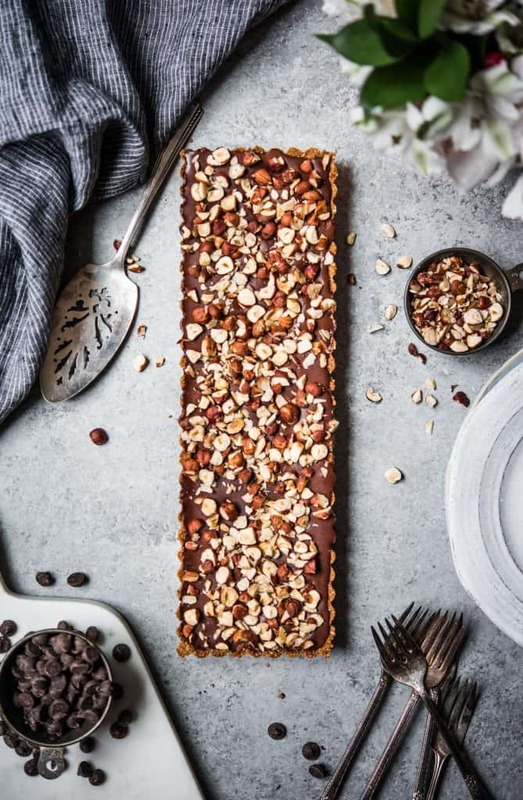 It’s never a bad time to make this dark chocolate hazelnut tart. It’s gluten free graham cracker and hazelnut crust is the perfect vehicle for the rich chocolate ganache filling. Plus, we added plenty of crushed hazelnuts for crunch. If you’re not a fan of hazelnuts, this recipe is similar and pairs peanut butter with a gluten-free pretzel crust. What’s better than a satisfying salty/sweet crust? The ganache is heavenly. It proves that you really don’t need dairy to make a delicious dessert. I guarantee that your non-vegan friends and family won’t notice any difference! 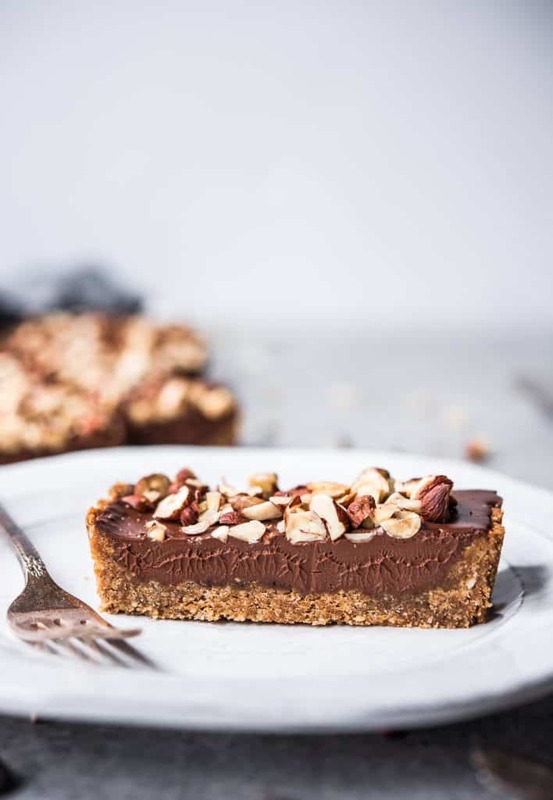 When it comes to vegan chocolate for this tart, go with a dark chocolate percent that you enjoy eating. We like chocolate in the 60-75% range for this tart. Any higher, and it’s almost too rich to eat a whole piece. FlavaNaturals dark chocolate is our go-to. It’s delicious and good for you with 5x the cocoa flavanol antioxidants of regular chocolate. Don’t forget to let us know if you try this vegan chocolate tart. We love seeing your Crowded Kitchen recreations, so tag us on Instagram @crowded_kitchen! You can also always let us know if there are other recipes you’d love for us to create – we’ll accept the challenge! 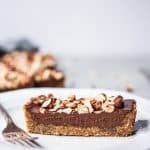 This dark chocolate ganache tart is completely vegan (and gluten free) and surprisingly easy to make! Nobody will ever know that it’s dairy free. Combine all crust ingredients in food processor and process until well combined. Make sure there are no large pieces of hazelnut. Press crust evenly into a 9-inch circular tart pan or a 14-inch rectangular tart pan. Use the bottom of a measuring cup to evenly press crust into pan. Poke a few holes in the crust using a fork. Bake for 10 minutes, or until slightly golden brown. To make filling, heat the entire can of coconut milk in a small saucepan over medium heat. Whisk occasionally. Don’t let it come to a boil or simmer – just let it heat up. Use a sharp knife to chop dark chocolate into small, equally-sized shards. If using chocolate chips, skip this step. Add chocolate chips to a large mixing bowl. Pour heated coconut milk over chocolate and let sit for 2 minutes without disturbing to let chocolate start to melt. After two minutes, stir with a spatula or wooden spoon until chocolate is fully melted and incorporated. 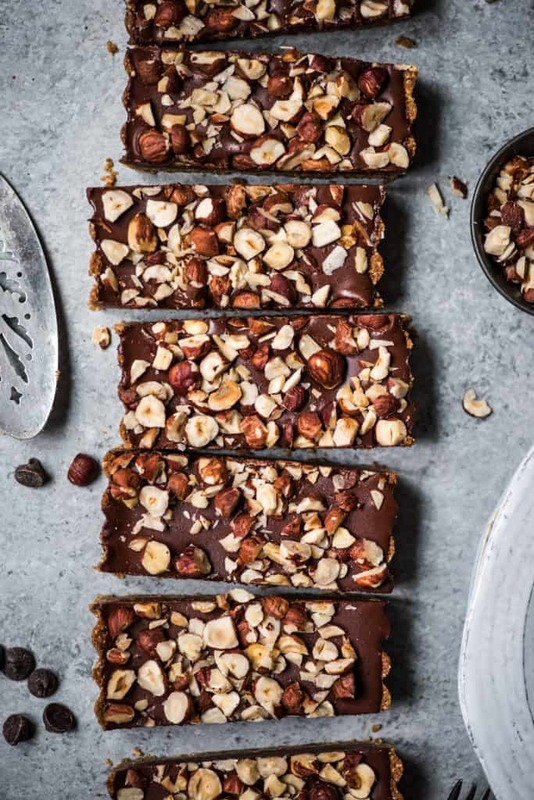 Pour chocolate ganache into cooled tart crust, smooth with a spatula and top with chopped hazelnuts and flaky sea salt (optional). Return to refrigerator for 2 hours, or until ganache is hardened. Store any leftovers in refrigerator for 5-7 days, or in a sealed container in freezer for up to a month. Canned full fat coconut milk is key! The coconut milk that comes in a carton doesn’t contain enough fat and won’t create the creamy, luscious texture we’re looking for.